I’m not a foodie. I’m a food lover. I actually hate the world “foodie”. It sounds like something a kid would say, like meany, or dummy, or fatty. But I love food, I love eating out, I love watching Top Chef, I love what food represents…it brings people together, it fuels my body for long exercise sessions, and it makes wine taste better. But, I don’t eat meat, poultry or pork and I don’t like cheese or cream, so I am a terrible restaurant orderer. I’m a little embarrassed about it. Whenever I see this scene from When Harry Met Sally, I cringe. It hits a little close to home. There are those rare occasions when I can look at a menu, tell the server I’d like the “salmon, please”, hand him the menu and say nothing else. I love when that happens. I’d love to be Padma, or Gail, and taste dishes from 16 different contestants without batting an eye. I’m working on it. I keep trying things over and over, and now I love sushi, raw fish, and salmon, which I wouldn’t touch a few years ago. I’ve actually gotten really good at picking around the things I don’t like, so when we go to dinners or parties I don’t have to be the obnoxious guest who needs a special menu. 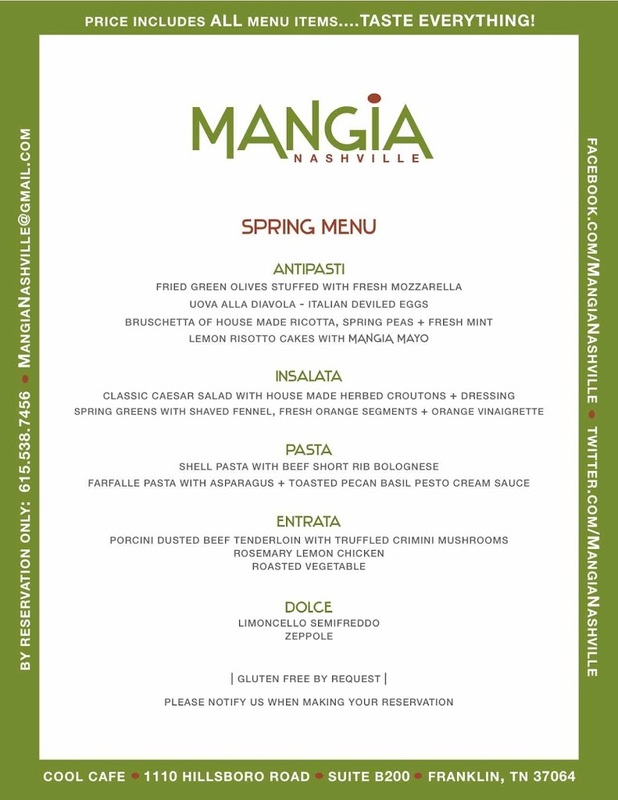 So when a friend invited us to her birthday party at Mangia Nashville, and emailed the menu below, I figured I’d eat the roasted vegetables and keep my mouth shut. Lucky for J and I, she put us in touch with the owner, Nick. I apologized profusely for being such a pain, but he said not to worry, he would take care of us. And take care of us he did! Mangia Nashville is the brainchild of Nick Pellegrino, a music industry guy with catering experience who came up with the idea of having a restaurant with good italian food, served family-style, in a place that felt like home. His friend Tim Ness, owner of Cool Cafe (a meat and three restaurant), offered up his restaurant on Saturday nights, which were closed anyway. 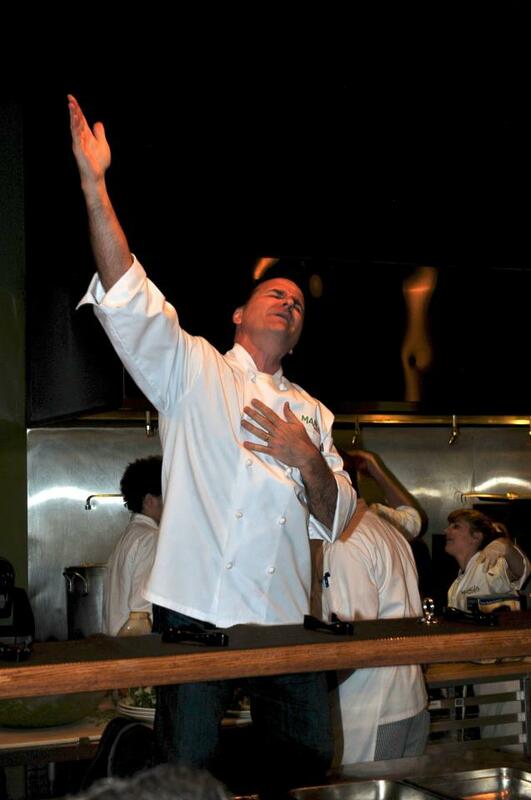 It opened last year and is now open Fridays and Saturday nights to mostly sold out crowds. We were late, because we forgot that it was located in Cool Cafe, and even though our GPS took us right there, we drove around for 20 minutes before we figured it out. We walked in to a packed room of about 10 white tablecloth covered tables. Some were really long, like the Thanksgiving table at my mother-in-law’s house every year that she has to move furniture to accomodate. Others were more intimate tables of 8-10. 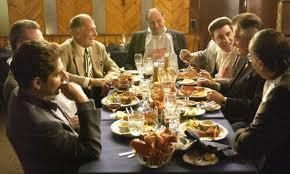 They say that if you have a small party you will probably be seated with strangers, which adds to the feeling that you walked into Tony Soprano’s house on a Friday night. There are two large screen TV’s silently running Godfather I and Godfather II. Every once in awhile someone at our table would look up and quote the dialog to go along with the scene. They had already started with the antipasti. We missed the olives, but they were passing around the bread, deviled eggs, risotto cakes and bruscetta. After we had stuffed ourselves the seemingly unending platters still looked full, and the server came to the end of the table and yelled, “CAN I HAVE YOUR ATTENTION PLEASE! IF YOU’RE FINISHED WITH YOUR ANTIPASTI, PLEASE PASS YOUR PLATES TO ME”. So we took the top of the stack of four plates and passed them to her. The rest of the meal went like that. The server would announce very loudly what she was passing around, we would eat, and dutifully pass our plates to her when the course was finished. Speaking of courses. I should have paid attention to the structure of the meal. Nick came out to tell us that he was going to prepare a lemon risotto with lobster for J and I since we couldn’t eat the beef and chicken entrees. After the salads (two, HUGE, served separately so everyone ate both), they brought a gigantic bowl of pasta with sun dried tomatoes and asparagus (yum) between J and I. I thought he must have changed his mind about the lobster and filled my plate with the pasta. It was really tasty so I stuffed myself. In between courses the wait staff would come out and pull us out to the middle of the restaurant for a conga line, or italian line dancing, with lots of italian mambo music and yelling and clapping. 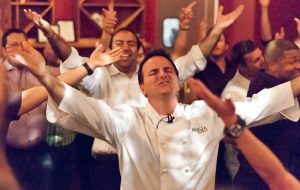 The chefs would stop what they were doing and either come out and dance or dance around the kitchen. It was all very festive. After lots of dancing I was waiting for dessert when the roasted vegetables and two different pasta entrees started being passed around, as well as the promised risotto and lobster. I couldn’t eat much, but I tasted it and should have saved room because it was light and delicious. Then, more dancing, passing plates back, dessert, and when we paid our checks ($45/per person), they brought little bags of hot doughnuts for the road. It was a fun evening. 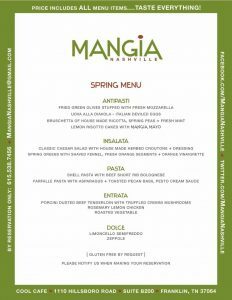 Their facebook page describes Mangia as an authentic New York family-style Italian dining experience every Friday @ 7:00 pm and Saturday @ 6:00 pm. Make reservations, because they sell out frequently. And come hungry!